18" x 26" Raised relief topographical map of Idaho printed at a scale of 1:1,125,000 or 1" = 20 miles. 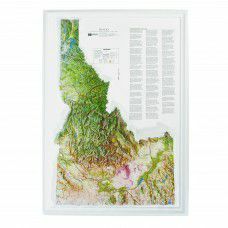 Unframed or framed - makes a great wall map of Idaho particularly for physical features. Many cities, towns, rivers, lakes and mountains labeled.